Stampin' Up! UK Demonstrator - Teri Pocock: Blog Candy Alert!!!!! Gorgeous candy is on offer over at Helen's blog! It is challenge linked and you have to ....... 'Make a card or other paper craft project using circles somewhere in the design'. All products Stampin' UP! unless otherwise stated. The image has been coloured with Promarker pens. Thanks for taking part, you're the 1st! 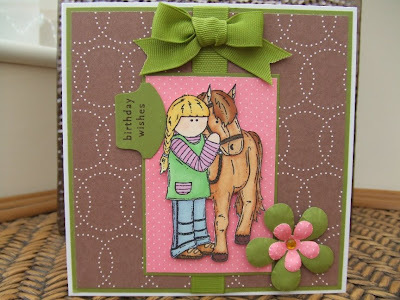 Lovely card and I love the circle DSP. What a great card. I love the colours you have used and the layout is fab. what a beauty. I love your circle themed entry . The image is absolutely darling.Your coloring is perfect as always. I also like how you added the round tab punch for the sentiment. wonderful! !